Betfair £30 | Compare odds UK, Europe, Premier League and European leagues. 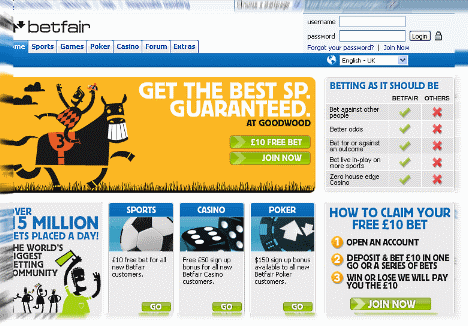 To claim your free [do action=”betfairfb”/] bet (currency equivalent), open a Betfair account. This offer is open to most most countries except the USA. Just check the country of residence list when opening. Make a deposit (min £10) to your account and then bet at least [do action=”betfairfb”/] in one bet or in a series of bets. You’ll receive your free [do action=”betfairfb”/] bet within 24 hours, whether you win or lose your bets! Did you know that sometimes you can ‘make’ your own odds – far bigger than the prices the bookies are offering? Well, now you can with betting exchanges! In the past backers had to accept the odds offered by bookmakers. If you didn’t like them, tough – your only choice was not to bet. Now backers can obtain better odds on betting exchanges – or, acting like a fixed odds bookmaker, they can ‘make’ their own prices! And that gives backers a wonderful opportunity to maximise profits. The Betfair betting exchange is the biggest and most would argue the best bookies around.